The second home game of the men’s rugby season was regarded as the team’s “first real test”, according to head coach Clive Gibson, as this game would be important in order to impose themselves against the other teams in their pool. 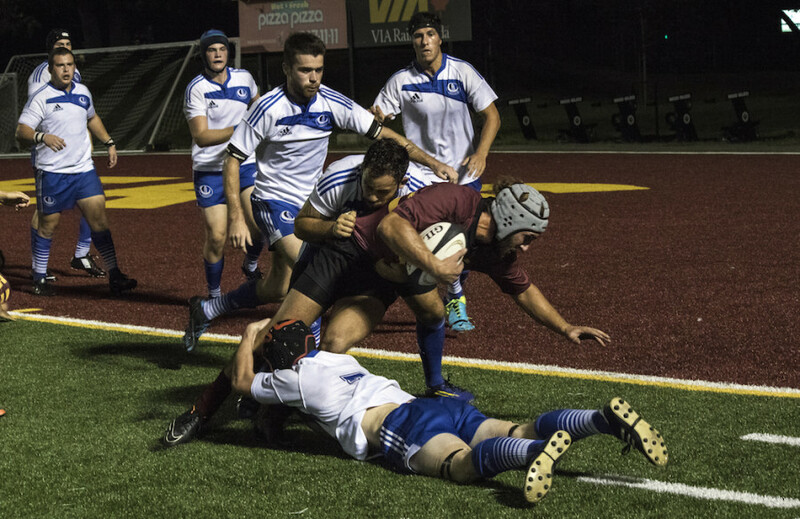 However, the result did not go Concordia’s way, and the men’s rugby team fell to the Université de Montreal Carabins 19-16 on Friday night at Concordia Stadium. The Maroon and Gold had the right mindset going into the game as they were the first ones on the pitch waiting for the men in blue and white, anxious to start the game. When the game did start, however, it was the Carabins that dictated the rhythm of the game. Five minutes into the match, the Carabins found space on the right side and centre Dimitri Bonkoski found a way into the try zone. Shortly after, in the 17th minute, Montreal converted a penalty to bring their lead to 8-0. 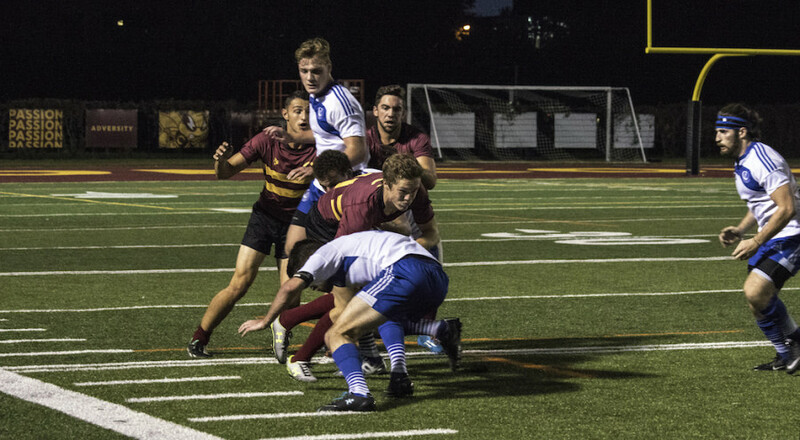 Concordia managed to get back into the match in the 27th minute as the hosts entered Montreal’s try zone for a score. After being forcefully denied access, flanker Graeme McClintock dove for the right side corner of the try zone to get five points for his team. At halftime, the scoreboard read 8-5. Back from the break, the Stingers found their game and started attacking their rivals. In the sixth minute of the second half, a penalty was called on the Carabins and kick taker Jonathan Banks evened the score. UdeM, or Les Bleus as they are sometimes called, and their vocal supporters weren’t done, however. In the 13th minute of the second half, Montreal pushed their maul against ConU towards their goal line. Two minutes later, Carabins fly half Vincent Chevalier-Pearson escaped on the left side and into the try zone. The Carabins were now up 13-8. By converting a penalty, the Stingers inched closer to the Carabins and found themselves only down 13-11. Concordia did score another try before the end of the match, but discipline problems ultimately led ConU to their first loss of the season. 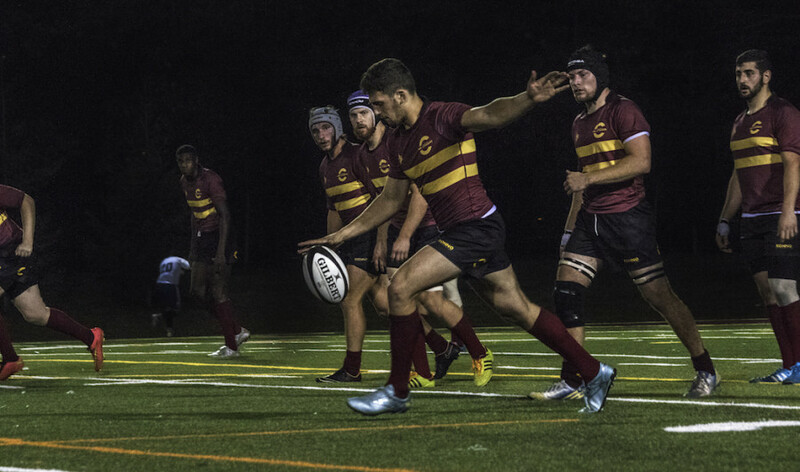 Two successful penalty conversions made this game a 19-16 affair and after a few minutes of protecting the score, Montreal left Concordia Stadium with the victory, much to the enjoyment of their supporters who made their way to NDG to support their team. As for Gibson, the situation seems more dire for a team who aspires for RSEQ greatness. Montreal are now atop their division with a 2-0 record, while Concordia is second with a 1-1 record, and the Sherbrooke Vert et Or are third with a 0-1 record. The Stingers will play their next game against crosstown rivals, the McGill Redmen, at Percival Molson Memorial Stadium on Sept. 27.